D.M. Sechler Carriage Co.; Wright Carriage Body Co.; Moline Body Corp.; McLaughlin Body Co.
Sechler & Company was just one of the many firms founded by Daniel M. Sechler (1808-1903) during the nineteenth century. Daniel Montgomery Sechler was born on March 4, 1818, in Danville, Pennsylvania to Rudolph and Susannah (nee Douty) Sechler. Following a public education he was apprenticed to a Port Deposit, Maryland carriage builder at the age of seventeen. He relocated to Milton, Pennsylvania in 1839 where he entered went to work for the Ball Carriage Works, eventually becoming a partner in the style of Ball & Sechler, Carriage Manufacturers. When his partner passed away he continued in the business for another three years, producing between fifty and seventy-five carriages per year. On January 19, 1841 Sechler married Miss Pamela Mackey, of Milton, Pennsylvania, producing one son, Thomas Mackey Sechler. Soon afterwards he sold the Ball & Sechler carriage works and moved to Wooster, Ohio, where he pursued other business ventures, one of which was an Adams County foundry. In 1852 Sechler was hired by an Ironton, Ohio machine shop to take over its pattern dept. and two years later he established his own nail works, the Star Nail Mill (later the Bellefont Iron Works), the first production nail supplier in Ohio. In 1858, he established a large wholesale and retail iron goods store in Cincinnati, where he sold goods manufactured by rolling mills and foundries located in Ironton and Pomeroy, Ohio. In 1867 he acquired an interest in the Swift Iron & Steel Works, of Newport, Kentucky and in 1869 became a partner in a Montgomery County, Tennessee, pig iron foundry. In 1877 Sechler returned to his roots, establishing a carriage works in Cincinnati, Ohio which was incorporated in 1879 as Sechler & Company. In late 1887 he sold his interest in the firm to a group of Cincinnati investors and retired, and set out on an extended European vacation. After almost a full year of retirement, Sechler came upon the realization that in order to be happy, he needed to work, and in 1888 established the D.M. Sechler Carriage Company in a rented facility located at 3rd Avenue (today’s Railroad Ave.) and 7th Street, in Moline, Illinois. In 1890 Sechler built a new factory at the corner of 3rd Ave. and 6th St. and by 1894 had introduced a line of private label bicycles which were marketed under the Eclipse, Road King, Falcon and Templar brands. By 1900 the carriage company employed over 200 hands who were producing as many as 6,000 vehicles per year. 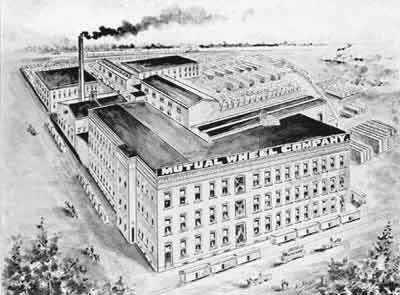 In April 1891 Sechler organized another Moline-based firm, the Mutual Wheel Company, in order to supply regional carriage manufacturers with a steady supply of well-built and reasonably priced carriage and wagon wheels. Organized for $40,000, Sechler served as president and J.C. Moon, of St. Louis’ Moon Brothers Carriage Company, vice-president. 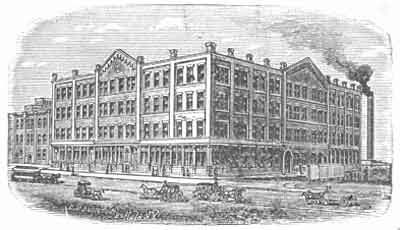 A new plant was constructed for the wheel company just east of the carriage works at 709 3rd Avenue, and by the time of Sechler’s passing, Mutual Wheel had become one of the largest manufacturers in the United States, with 250 hands turning out 100,000 sets of carriage, wagon, and buggy wheels per year. Sechler’s long experience in the production of iron goods resulted in the introduction of the Black Hawk corn planter in 1897. Built at the Sechler carriage works, the Black Hawk eventually became the second largest selling planter in the nation and it popularity led to further products, including a popular line of manure spreaders. In November of 1910, the company changed its name to the D.M. Sechler Implement & Carriage Co., but the post war depression of 1918-1919 forced the sale of the firm to the Ohio Cultivator Company. In 1931 a spectacular fire destroyed the firm’s massive factory causing damage estimated in excess of $100,000 to the plant and adjacent factories. On January 8, 1889 Thomas M. Sechler joined his father in Moline as vice-president of the carriage works, and when his father passed away on May 27, 1903, took over as president. He was also a director of the Moline Wheel Co. and was also the founder and president of the Wright Carriage Body Company, which was founded in November of 1902 with a capital of $50,000. Wright’s officers included T. M. Sechler, president; C. W. Wright, vice-president and manager; Edgar H. Wilson, secretary and treasurer. Its directors included T.M. Sechler, W.L. Velie (of the Velie Carriage Co., Moline), H.C. First, C.W. Wright, Fred Peters, E.H. Wilson, Elmer E. Morgan and C.H. Dooley. The new firm erected a two-story 160’ x 60’ factory building, as well as a 60’ x 65’ wing for engine, boiler and dry house, and production of carriage and buggy bodies and seats commenced in March of 1903. Located at 1625 3rd Ave. at the intersection of 3rd Ave. and 24th St., the Wright Carriage Body Co. went on to build some early production automobile bodies for Velie, Pan American, R&V (Moline)-Knight, and Stearns-Knight as well as a line of Ford Model T& TT Driver Salesman Truck bodies. The firm was reorganized in 1921 as the Moline Body Corp., manufacturers of open and closed production automobile bodies for Marmon and Velie. In August of 1925, the firm was reorganized once again, emerging as the E.H. Wilson Manufacturing Co. The Wilson company manufactured production bodies for Marmon and General Motors’ recently organized Yellow Truck and Coach Mfg. Co. In late 1925 Wilson received a record order from Yellow Cab for 1,000 taxi-cab bodies, but are best-remembered for a small series of bodies they constructed for the 1927 Marmon E-75 Speedster. Harry McLaughlin was born in St. Louis Missouri on February 17, 1897 and moved to Moline in 1926 where he found employment with the E.H. Wilson Mfg. Co. as a patternmaker and draftsman. When that firm withdrew from business in 1932 he formed the McLaughlin Body Company, of which he is president, director and majority stockholder. Ray Cundy, the firm’s vice-president was also an investor and director of the firm. The McLaughlin Body Co.’s early customers included Diamond T, GMC, International Harvester and Minneapolis Moline. During World War II, McLaughlin supplied the U.S. Army with various products including cabs for the infamous White half tracks. In 1956, the company established one of its current manufacturing plants in East Moline, Illinois by purchasing Buddy L Toy Plant and the Minneapolis Moline Foundry building. In 1959, McLaughlin built the first cab for the John Deere Combine. The next decade McLaughlin continued to build Aluminum truck cabs for IH and in the late sixties, McLaughlin pioneered change with the development of the first Roll-Over Protective System (ROPS) cab for Farmall Tractors. During the 1970's, newer designs were implemented for John Deere on their combine cab and McLaughlin also began production of a galvanized steel cab for Mack Truck. The eighties brought many challenges to the company due to the downturn of the Ag Industry, although the company was fortunate to have diversification with the trucking industry and started production of the Ford CL-9000 Aluminum Truck Cab in 1987. McLaughlin was first in the cab industry to utilize e-coat paint and this system was installed in 1988. Also in the late 1980's, McLaughlin once again started to build for the military and continues to this day to provide truck cabs for military use. Continued growth in the 1990's led to diversification into other markets such as construction and even front-end loader equipment. Today McLaughlin produces cabs for John Deere, CNH, Caterpillar, Agco, Stewart Stevenson, AM General, International Harvester, Ford and Mack from its two plants, one located near the Case and John Deere Harvester plants in East Moline, Illinois, the second inside the I-H Farmall plant in Rock Island, Illinois. Thomas M. Sechler was born October 25, 1841, in Milton, Northumberland County, Pennsylvania. After a public education in Adams and Lawrence counties, he attended Cincinnati’s Hughes High School, graduating in June of 1860. He enrolled in Marietta College that fall, graduating third in his class on July 2, 1863. Immediately after graduation, Sechler enlisted in the Union Army and served with the Second Ohio Artillery, serving as acting Assistant Adjutant General, acting Assistant Quartermaster, and Provost Marshal. When hostilities ended he held the rank of First Lieutenant. From 1866 to 1869 he was associated with his father’s Cincinnati iron goods store and from 1869 to 1877 was placed in charge of the family’s pig iron foundry in Montgomery County, Tennessee. In November 1877 he returned to Cincinnati to work at Sechler & Company, remaining with the firm until his father retired in May, of 1887. Sechler was an active member of the GAR (Grand Army of the Republic) and served at various positions including Cincinnati Post Commander, and chief mustering officer of the Department of Ohio. 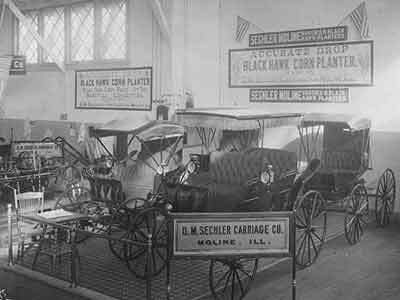 Sechler was also an active member of the National Association of Carriage Builders, serving as its vice-president for a three-year term. Ralph L. Barger - A Century of Pullman Cars. Vol. 1, Alphabetical list, and Vol. 2, The Palace Cars.